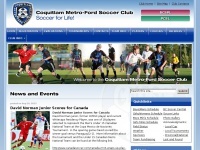 CMFSC offers both recreational, elite and BCSPL programs to over 3, 500 youth and adult players. A leader in the community and offers Soccer for life. The web server used by Cmfsc.ca is located near the city of Ashburn, USA and is run by Amazon.com. There are many websites run by this web server. The operator uses this server for many hosting clients. In total there are at least 1,506 websites on this server. The language of these websites is mostly english.